Home » Mattress Comparisons » Sleep Number vs Purple: What’s Best for You? 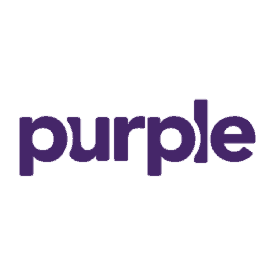 Sleep Number and Purple are two well-known mattress companies thanks to strong brand and marketing tactics, along with high-quality and innovative products. However, when it comes down to the nitty-gritty, they’re very different beds. 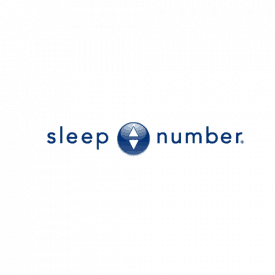 The first differentiator between Sleep Number and Purple beds is their product offering size. Sleep Number has seven different mattresses to choose from that all provide very different levels of support for different types of sleepers. On the flip side, Purple technically has only two mattresses, though one line comes in a few different sizes. Instead of variety, Purple focuses on utilizing unique materials to bring consistent comfort designed to specifically relieve pressure. 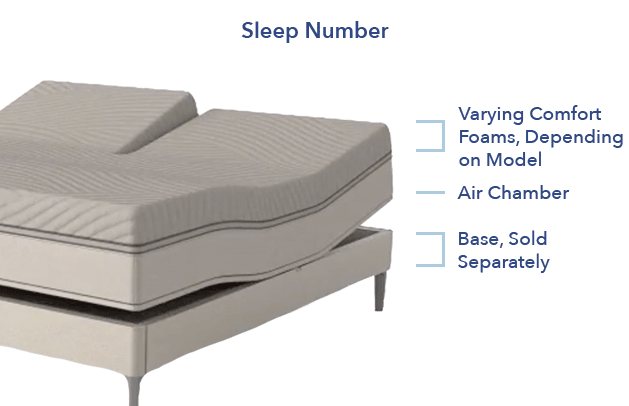 All Sleep Number mattresses are technically air chambers that range from 8” to 13” in thickness. These mattresses can inflate or deflate air via a remote or app to change the level of firmness inside the bed. The air chambers are made of 24 gauge vulcanized rubber with a cotton fabric adhered to the exterior through a heat treating process. For most Sleep Number models, a Double-sized bed and up means your bed will utilize DualAir technology so each side of the bed can be individually adjusted — a feature most couples seem to like. Above the chamber: Above the air chamber will be. The c2 bed is the only model with no foam mattress pad on top of the air chamber. Instead, it has a soft fiberfill sewn into a thin layer right above the air chambers. Naturally, the c2 model is the firmness mattress option. Once you move up to the c4 model, your bed will come with 1.5 inches of foam above the chamber. Move all the way up to the i10 model, and your bed will include 7” of foam. The foam itself will vary as well, from memory foam to Ergonomex™, which is infused with a swirl gel. Some layers offer specific pressure relief in different areas of your body, and others provide cooling technology. Below the chamber: Below the air-chamber will be your base, which is sold separately. If you want to purchase one from Sleep Number, they provide a few options. Sleep Number recommends their FlexFit™ Adjustable Base, which lets you raise the head and/or foot of the bed. The FlexFit™ 2 also includes adjustability that gives off the “feeling of zero gravity,” and the FlexFit™ 3 base heats up the base of your mattress so your feet are warmed as you fall asleep. If you don’t want to go that route, Sleep Number also recommends a Sleep Number Modular Base, or a basic platform base if you have one. The mattress cover is made from a blend of Rayon and polypropylene fabrics and comes with a zipper so you can access the hoses needed to pump air into the air chamber. While the cover technically is removable, it’s not recommended you wash it. This will result in shrinking and permanently damaging your cover. Instead, try spot cleaning any stains with a mild detergent. Like we mentioned above, each Sleep Number bed will offer varying degrees of comfort and support. If you know you like a certain level of comfort, you can be pointed in the right direction by looking at the model number of each Sleep Number bed. The “10” in i10 is the highest number in the series and comes with the most cushion. If you want the cushion, but just not seven inches of it, then the i7 or i8 beds might be a better option, with a few fewer inches of plump support. If you know you like hard beds that are extra firm, Sleep Number’s c2 or c4 might be a better fit. An important point to make is even the i10 model won’t feel over-the-top soft. While seven inches of foam might sound like you’re going to simply sink into your mattress, a lot of people said the foam on top is just the right amount of sink in softness and still offered a solid combination of support from the air bladder and cozy “floof” from the padding.” Overall, it sounds like having a firmer sleep number setting coupled with the comfy comfort foam balanced out softness and support quite well. As far as edge support goes, these mattresses had mixed reviews. Many people said they provided good edge support (so you can roll to the sides of the bed and not feel like you’re going to fall off,) but those with heavier frames said they experienced discomfort and a lack of support while laying close to the side. On the flip side, most people complained about experiencing “trench effect,” which is when the bed sags in the middle and one or both people on the bed slide into it. Because most Sleep Number beds come with two air chambers, the bed is often uneven and susceptible to sagging in the middle. Lastly, a handful of Sleep Number beds provide cooling technology to regulate temperature at night and pull heat away from the bed. This is specifically found in the p6, i7, i8, and i10 models. Shipping – $199.99 for delivery and setup or you can pay $89.99 for UPS delivery. Comes with smart bed options. 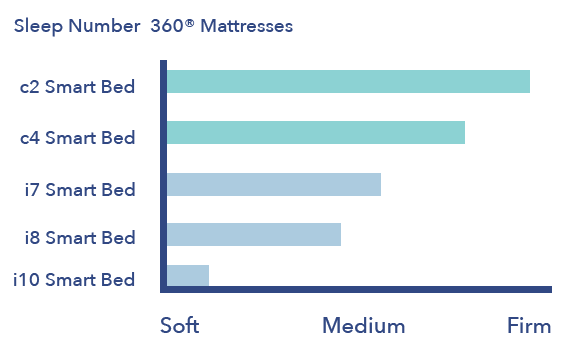 Every bed excluding the c2 and c4 is a smart bed Read the 360® I8 mattress review to learn more about these features! 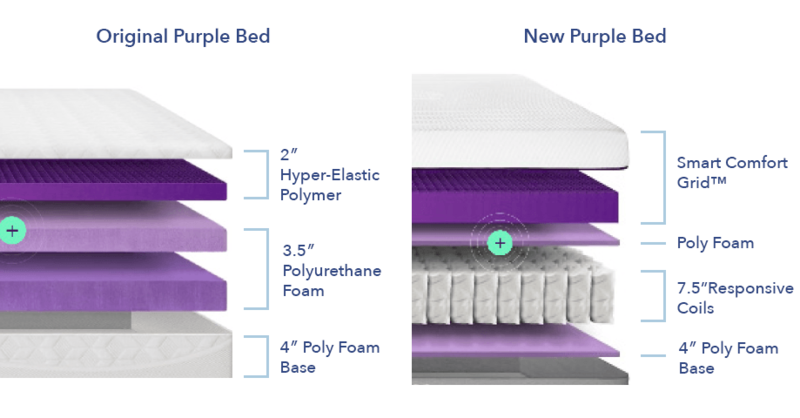 While there are some key differences between the Original and New Purple mattresses, both come with the hyper-elastic polymer comfort grid in the top layer. As far as pressure relief, each bed goes about it differently — the Original uses responsive foam and the New Purple uses a pocketed coil system. Purple also claims that both beds are “temperature neutral” and are able to acclimate to anyone’s body heat and cool them down. That said, the New Purple includes a layer of pocketed coils which encourages even morebreathability through the bed. Top layer (cooling & comfort) – 2″ of hyper-elastic polymer designed to provide cooling pressure relief and bounce. Middle layer (support) – 3.5″ of polyurethane foam that acts as the support for the mattress. 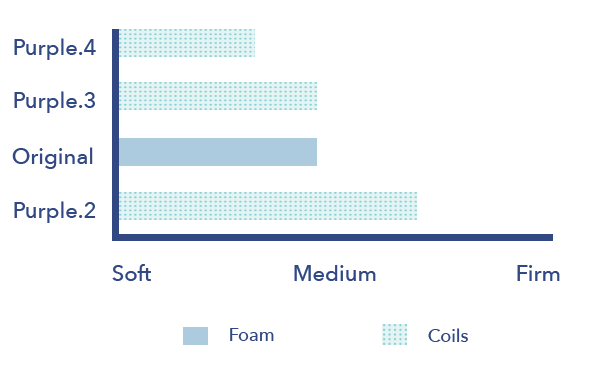 Bottom layer (foundation) – 4″ of polyurethane foam that provides a foundational base for the mattress as a whole. The new Purple mattress looks a little different. Top layer — The top layer comes in various heights due to different thickness amounts of Smart Comfort Grid™, which is composed of a hyperelastic material that adapts to your body in real time. The P2 has two inches, the P3 has three inches, and the P4 has four inches. Transition Layer — A thin layer of polyurethane foam separates the soft comfort layer from the pocketed coil system below. Middle Layer – 7.5” of responsive coils that help isolate motion and extend the pressure relief of the top comfort layer throughout the entire structure. Bottom Layer – The base is made up of a thin layer of high-density poly foam, functioning as a springboard for the pocketed coil system. The cover’s for the original and new Purple mattresses are slightly different by design. The original mattress cover is made up of a blend of Polyester, Viscose, and Lycra that is both soft and breathable fabric, allowing airflow into the mattress. The new cover is built with a polyester and spandex blend, making for a material that’s thicker, but still stretchy and breathable. The Purple mattresses will provide a relatively medium level of firmness, and is generally great for all different types of sleep styles and preferences thanks to Purple’s mattress construction that provides comfort whether you sleep on the back, side, or stomach. However, there are key differences in how the bed feels depending if you choose the original or new mattress. The biggest difference in the New Purple is its hybrid design and the inclusion of pocketed coils; these provide an overall bouncier structure than the original, and helps to position the sleeper on top of the bed. However, both beds still offer deep contouring qualities with a focus on targeted pressure relief and cooling technology. Both beds provide good edge support, but the New Purple places a bigger focus on it, creating an overall more stable structure that’s a great option if you sleep with a partner. Another important attribute from Purple is its level of support. The bed is designed so that the heaviest parts of your body will experience more sinkage than the lighter areas. In other words, the polymer is providing pressure relief while still maintaining a high level of support. Lastly, Purple mattresses are designed to keep you cool, whether it’s by their smart grid design found in their New mattress, or the responsive foam used in the original model. Purple vs Sleep Number: Which Should You Choose? Based on all this information, here are the key differences and attributes of each bed. You want personalization. Since you can adjust the amount of air in the air chambers, you can always make your mattress feel softer or firm with the click of a button. You sleep with a partner. Sleep Number’s DualAir technology allows you to adjust either side of the bed, a great feature if you sleep with a partner who enjoys a different level of firmness from you. You’re interested in smart integration. Most Sleep Number beds (excluding c2 and c4) are smart beds that include features such as ResponsiveAir technology (your mattress will adjust to your movements as you sleep) and an integration with a SleepIQ app so you can review reports on your sleep health as soon as you wake up. You need pressure relief. Perhaps Purple’s #1 selling point is its focus on pressure relief and body contouring thanks to its pressure-relieving materials built into the comfort layers. You typically sleep in different positions. While Purple only has a few mattresses to choose from, it’s designed in a way to support all types of bodies and positions, making it a good choice if you roll around a lot. You sleep hot. Promoting air-flow is front and center for Purple, and based on all the reviews and reads, this mattress definitely keeps cool.